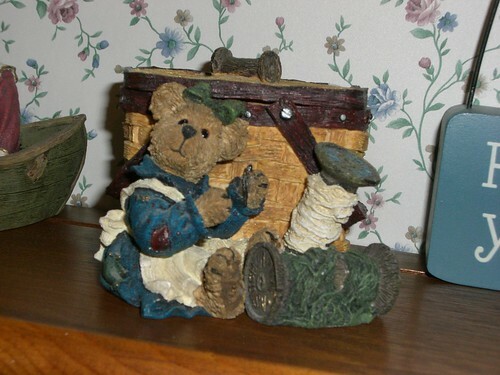 Posted on August 10, 2007 by Barbara H.
I used to like all kinds of bears, and then I discovered Boyd’s Bear figurines. I love them! They’re so cute and so detailed. Through the years my family, mainly my mom and my husband, have given me various ones. Some of my favorites are the ones that reflect my interests or what’s going in my life. I have several “couples,” most given to me by my husband. This one is special because he gave it to me on our last anniversary because we had gotten engaged while sitting on a log in a state park. Here are a couple of the “Mom” ones. …and chocolate. 🙂 And hearts. 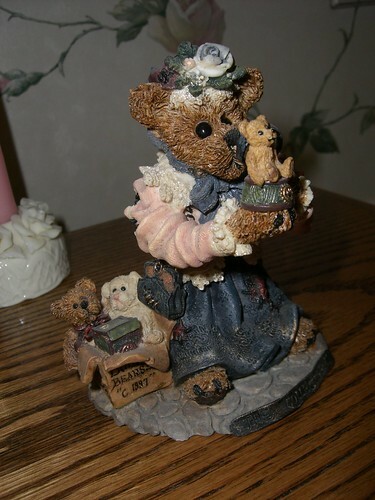 This is a Boyd’s Bear Collector. My mom gave me this one when we were home schooling several years ago. 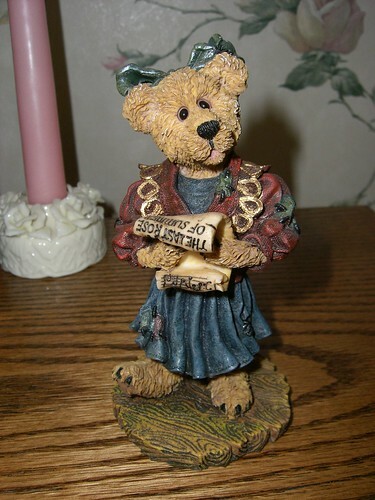 This was one of my first Boyd’s Bears. Cooking is, of course, one of my major duties. This is a little sewing basket. I used to do a lot more sewing. Finally I want to show you the little curio cabinets where most of these stay (though I have several throughout the house.) These were just little cheapie ones at Wal-Mart, and we discovered when we got them home and put together that they weren’t deep enough for many of the figurines. So my husband took apart the back and added about an inch of wood all around the back and added a mirror because the bears really weren’t showing up well amidst all the brown. Isn’t he talented? 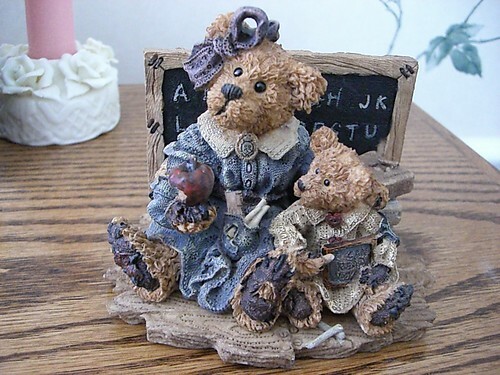 This entry was posted in Decorating, Favorites, Show and Tell Friday by Barbara H.. Bookmark the permalink. Oh! Look how cute! I want some. I kept trying to think which one was my favorite, and I realized that we must be a lot alike, because they are all my favorites, and all things similar to me!! Cute and sweet, and your husband is very talented! Oh, they are all sooooo cute! I really can’t chose my favourite out of them! Well done for your hubby, he did a great job! I WUV ‘EM!!! 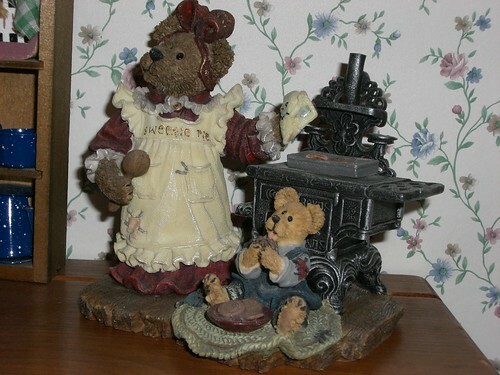 I used to collect bears as well, stuffed ones and figurins. 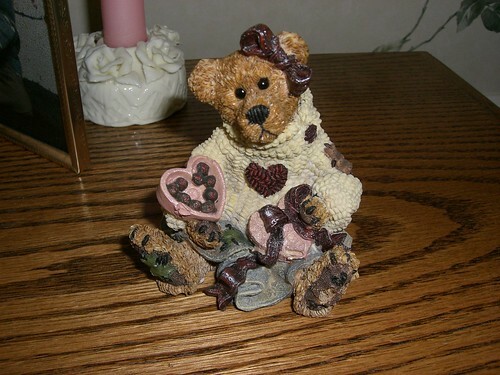 I still have a few of my Boyd Bear items. Since I am a homeschooling mom, my fave is the mom with the chalkboard! Oh and your hubby did a great job on those curio boxes. They look great! You have a wonderful collection. I especially like the couple on the bench. My husband I read out lo each other sometimes and it made me think about those fun times. I think I’m shaped like that bear, too 😉 Your husband was clever expanding the back of the cabinets, and he did a fabulous job. He’s a keeper! Great show and tell!! Mine’s posted too. About an ‘antique’ keyboard of mine!!! Such a variety. What a nice collection you have. Cute. And LOTS to dust! Wonderful bear collection. Who could not love these cute bears? What a great collection. I especially love the one with the cookstove. It reminds me of the stove at my grandmothers house. Very precious. What a handy guy you’ve got there adding on to those cabinets, brilliant! Blessings. Love all your Boyd’s bears. They are so cute! Thanks for sharing. 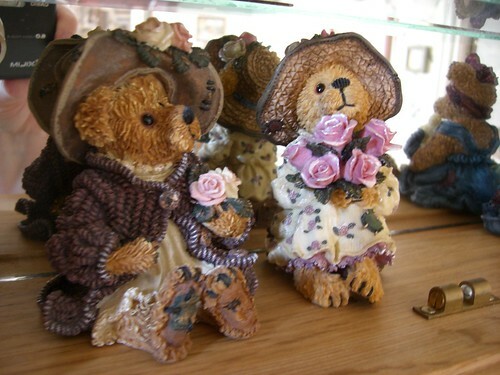 Adorable bears! I love the reading one!! They are really cute. I love their expressions. Wow, that is quite a collection! Very nice! You asked about making watermarks on my blog. My husband is going to *try* to put together a tutorial—hopefully soon! BUT you may not need it. I see you are using WordPress, just like me. There is a plug-in you can download that will automatically add watermarks to your photos if you have the photopress plug-in. That’s how we did mine. 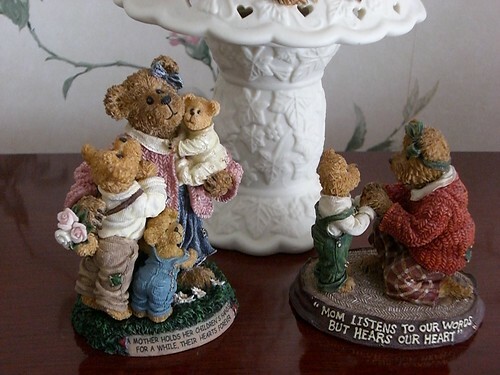 I also collect Boyd’s Bears figurines!! My munchkin is fascinated by them and each day my husband or I take one down for him to examine. The look on his face when he does so is precious!!! I plan to add to my collection with his milestones. GREAT collection. 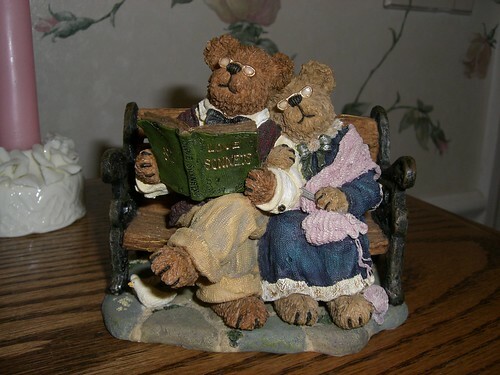 I’m a fan of these bears too. Gripe water is given to babies for colic or gas or general stomach discomfort. My son would spit out his soother when he saw the bottle coming. He loved the stuff!! What a fun and very cute collection! I love to see what other people collect. My favorites in the above are the “just because” gals with the roses! And I want to say thanks also for your comments on my blog today. What a wise man, just as his grand daughter who kept the ‘payment’ all this time! I think your bears have the sweetest little faces! Your collection is wonderful and I love how you have them displayed! Thanks Barbara for sharing. I have the Bear Collector also. I love the one of the reader and the sewer. I joined the club just last month and they sent me a catalog. If you have that you can go to their site and they’ll tell you where you can order the ones in there. I saw one or two I really like. Next Tuesday I am going to fly to Baltimore. My son’s family live in Emmitsburg, Maryland which is less than an hour from the Boyd’s Barn in Gettysburg. I have already put in my request for a trip there. The grands love to go too. 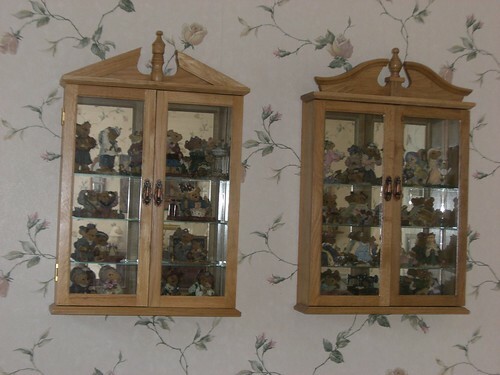 What a neat bear collection. My favorite is the lady by the old stove. It really brings back memories. I love them all but my favorite is the old couple-so cute! 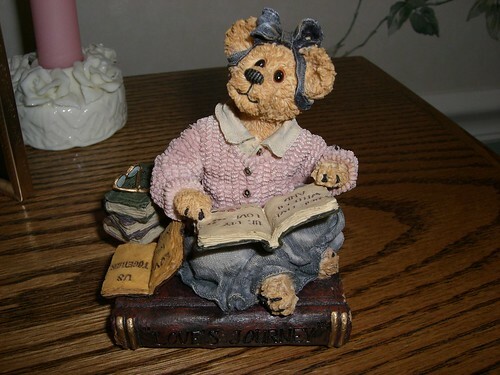 I have several Boyd’s Bears too, love them! I couldn’t view the display cabinets, keep getting the little x’s there, I’ll try again. Have you read the newsletters BB’s used to do (don’t know if they still do or not) they are so very cute with the wording! The pictures are WONDERFUL. You have a great collection of bears there! Have a good weekend, Barbara! What a gorgeous collection! I love the way you have displayed them too. Thank you for visiting Patra’s Other Place! I have quite a collection of Boyds Figurines myself..Unfortunately I have to sell them to make room. If you are interested as to which one’s I have and $$ please contact me.